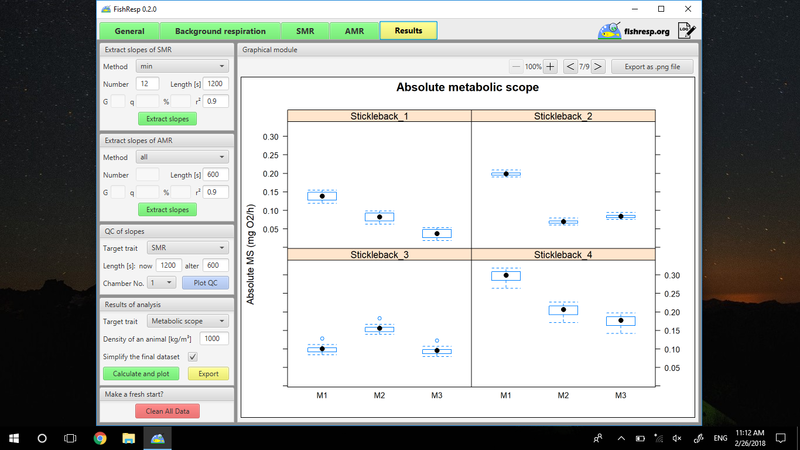 The GUI application ‘FishResp’ represents graphical implementation of the R package ‘FishResp’. This application has been developed for users who are not familiar with R language or prefer to work with a graphical user interface (GUI) instead of a command line. The application is free and cross-platform (available for Windows, Linux and Mac OS). To download the application, please click on an icon representing your operational system. The installation process should take not more than 10 minutes. 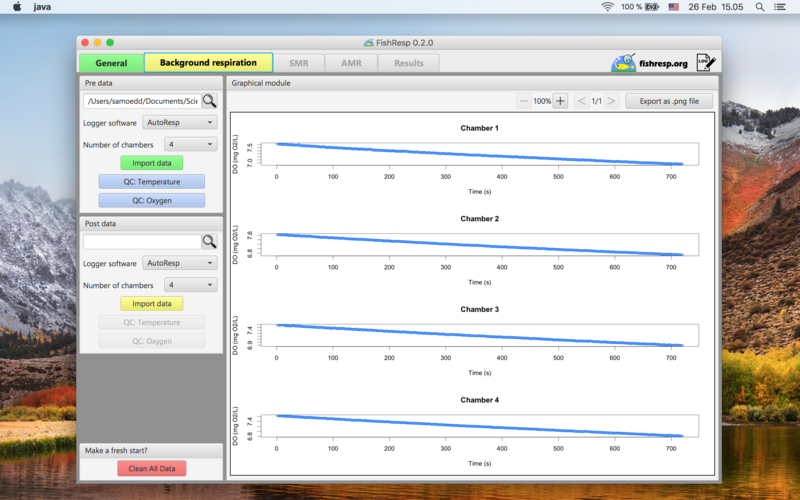 If you use a multi-channel respirometry system to obtain raw respirometry data (e.g. four chambers/tunnels at the same time), we recommend to work with a relatively large screen display to ensure comfort visual interaction with the ‘FishResp’ application. Please install R and Java Development Kit (version 8!) before setting up the GUI application ‘FishResp’. If you have a problem with installation process, please contact us through the forum. Further instructions are OS-specific and can be found below. To set ‘FishResp’ as a program on Windows, unzip the loaded archive and open the file ‘FishRespSetup.exe‘. Then, accept the license agreement and follow to further instructions of the installation wizard. × If the R packages are not installed in your R library, the configurator will be automatically opened. Please specify the path to the folders, where R and it's library are located, to install the latest versions of those packages. After installation of the R packages, which might take several minutes, click 'Save'. The software consists of five tabs with functional blocks on the left side and information or graphical modules on the right side of the application. The analysis of data goes step-by-step: from the left tab to the right one, top-down in each tab. Demo data for the application! 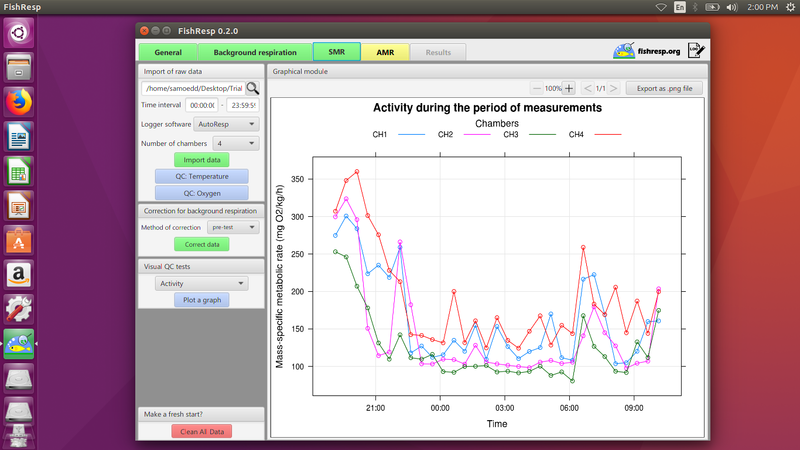 These sets of raw data were collected using an intermittent-flow respirometry approach and AquaResp (Loligo Systems). Check it now and leave feedback here. Three screenshots represent the GUI application for Windows, Linux and MacOS, respectively.